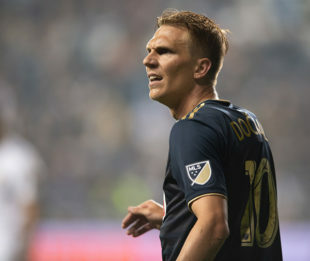 Borek Dockal aka “Captain America” to Czech newspapers, returns from the UEFA Nations League games for the Union’s playoff push. Curtin chats to the media before Sunday’s match against the Red Bulls. Bethlehem returns to the USL Eastern Conference Quarterfinals in the third Keystone State clash against Pittsburgh tomorrow. The Steel are basically the 2016-17 Milwaukee Bucks. Here’s some other attack-minded teams compared to NBA teams in this list of who to root for in the USL Cup Playoffs. NISA will be adding a team in the Philadelphia market for inaugural season in 2019. The MLS is on track for one of the highest scoring seasons in league history with an average of 3.20 goals per game. A look at how former MLS or league academy players are doing in international clubs this year. Understandably, Orlando City is not thrilled about breaking the most goals conceded record. Wayne Rooney broke Twitter after the win over Toronto FC on Wednesday. The winners and losers, good and bad of the October international fixture window. Pablo Machin brings balance, perspective and a bit of surprise to Sevilla, who sits at the top of La Liga’s table. Ibrahimovic says Jose “Mourinho’s critics are jealous”. Don’t hate the player, hate the game, right Zlatan? USMNT’s 18-year-old Josh Sargent will be moving up to Werder Bremen’s first team from the reserves. Founder of Mexico’s first professional women’s soccer team, Marbella Ibarra found dead near Tijuana. Can we lose “The MLS”? Does anyone say The Major League Soccer? Hear it all the time here- The NHL, The NFL, The NBA. But it also happens elsewhere… it’s not Liga. It’s La Liga. The word – The- assigns meaning and value unlike say, Ralph Ellison’s book about being black in America, Invisible Man- which was intentional from the author in leaving out- The. Nice try, smarty el pants. Look at the last word of MLS. A little different than the L or the A.
I say The MLS all The time. It’s only a small percentage of The MLS fan base (in itself a de minimis group) that reacts negatively to it. Listen to any other sportscast and you’ll heat breathless commentators referring to The National Hockey League, presumably to alert viewers they had not accidentally tuned into the KHL. Smarty pants was an intentional play for an argument that is passé. a Longfellow too besides a smarty pants. so much important footy stuff out there and people still discussing The. Play the key starters sparingly until playoffs. Keep Doakal , Med, Ilsinio and Blake rested . no more than 20 minutes. Bedoya no more than a half. Things to Work and Plan for. Figure your out how to keep a lead when you are up a goal in the last 10 minutes ? How to defeat a speedy counter attacking team. Playing in a tight arena ie NYC. Keeping your cool when you have a one sided ref. Not waiting too long to sub on a player.